Happy to report, that the Happydent site is as irreverent as the brand itself! For starters, there is a ‘smile slider’ video innovation on the site, where you can get the bored model to smile by popping open the Happydent box. The same concept is being used in rich media as well (ref the Youtube Masthead innovation last week). Created by Digivaasi , the site has a dark creative, depicting the night. Downloads, Products and TVCs open on a projection screen. 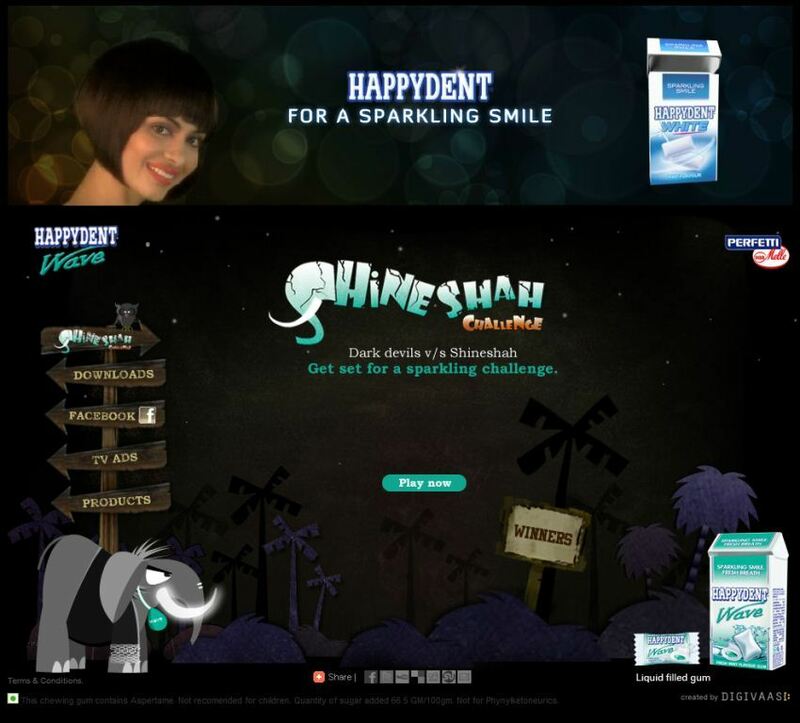 The fun element is provided with the Shineshah Challenge which is a game that pits Dark Devils vs Shineshah (an adorable sparkling tusked elephant). Users can select a language of choice from Hindi, Kannada, Tamil & Telegu and there is an entertaining story that is played out in the preferred language (! ), which doubles up as an intro to the game. The Game itself is simple but addictive. The intro should be used as a viral across digital. It has the potential to catch on. Very engaging, lots of fun and well laid-out. The site sticks to its theme. The Happydent Facebook Page has a TV Contest running for Happydent Complete, where fans need to guess What Happens Next in the TV ad. Fans can also submit their pictures and Happydent picks one as the profile pic of the day.